William Faulkner is one of the most celebrated writers in American literature generally and Southern literature specifically. Though his work was published as early as 1919, and largely during the 1920s and 1930s, Faulkner was not widely known until receiving the 1949 Nobel Prize in Literature, for which he became the only Mississippi-born Nobel winner. Two of his works, A Fable (1954) and his last novel The Reivers (1962), won the Pulitzer Prize for Fiction. In 1998, the Modern Library ranked his 1929 novel The Sound and the Fury sixth on its list of the 100 best English-language novels of the 20th century; also on the list were As I Lay Dying (1930) and Light in August (1932). Absalom, Absalom! (1936) appears on similar lists. His first published story, “A Rose for Emily“, is one of the most famous an American has written. From the early 1920s to the outbreak of World War II, Faulkner published 13 novels and many short stories. Such a body of work formed the basis of his reputation and earned him the Nobel Prize at age 52. Faulkner’s prodigious output includes his most celebrated novels such as The Sound and the Fury (1929), As I Lay Dying (1930), Light in August (1932), and Absalom, Absalom! (1936). Faulkner was also a prolific writer of short stories. His first short story collection, These 13 (1931), includes many of his most acclaimed (and most frequently anthologized) stories, including “A Rose for Emily“, “Red Leaves“, “That Evening Sun“, and “Dry September“. Faulkner set many of his short stories and novels in Yoknapatawpha County — based on, and nearly geographically identical to, Lafayette County, of which his hometown of Oxford, Mississippi, is the county seat. Yoknapatawpha was Faulkner’s “postage stamp”, and the bulk of work that it represents is widely considered by critics to amount to one of the most monumental fictional creations in the history of literature. Three of his novels, The Hamlet, The Town and The Mansion, known collectively as the Snopes Trilogy, document the town of Jefferson and its environs, as an extended family headed by Flem Snopes insinuates itself into the lives and psyches of the general populace. His short story “A Rose for Emily” was his first story published in a major magazine, the Forum, but received little attention from the public. After revisions and reissues, it gained popularity and is now considered one of his best. Faulkner was known for his experimental style with meticulous attention to diction and cadence. 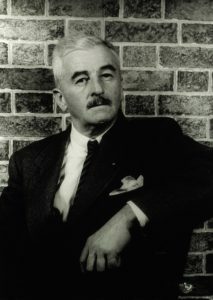 In contrast to the minimalist understatement of his contemporary Ernest Hemingway, Faulkner made frequent use of “stream of consciousness” in his writing, and wrote often highly emotional, subtle, cerebral, complex, and sometimes Gothic or grotesque stories of a wide variety of characters including former slaves or descendants of slaves, poor white, agrarian, or working-class Southerners, and Southern aristocrats. Faulkner studied at the university and wrote many literary classics at his home, Rowan Oak, which sits on 32 acres off Old Taylor Road. He lived and worked there from 1930 until his death in 1962. In 1972, his daughter, Jill Faulkner Summers, sold the house to the university to secure it as a place for people to learn about her father and his work. The University maintains the home in order to promote Faulkner’s literary heritage. Tours are available. 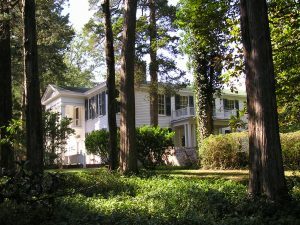 The home has been visited by such writers as John Updike, Czesław Miłosz, Charles Simic, Richard Ford, James Lee Burke, Bei Dao, Charles Wright, Charles Frazier, Alice Walker, the Coen brothers, Bobbie Ann Mason, Salman Rushdie, and others. Writer Mark Richard once repaired a faulty doorknob on the French door to Faulkner’s study. After its most recent renovations, some of which were funded by part-time Oxford resident and Ole Miss law school alumnus, John Grisham, Rowan Oak was rededicated on May 1, 2005. William Faulkner reads his speech accepting the Nobel Prize in Literature, which he was awarded in 1949. At the time this speech was given, the world had just emerged from the chaos of the Second World War, and the threat of atomic annihilation hung over humanity. Faulkner’s faith in the human spirit, as expressed in this speech, rejects in his way the horrors of the preceding decade. Listen to the speech below or read the transcript.